Two weeks into earnings season, and with 53% of the companies in the S&P 500 having reported actual for Q2 2018, it's shaping up as a blockbuster quarter: in terms of earnings, 83% of companies have reported EPS earnings that are above estimates, and if that number carries through the end of earnings season it would be the highest percentage of beats since FactSet began tracking this metric in Q3 2008. 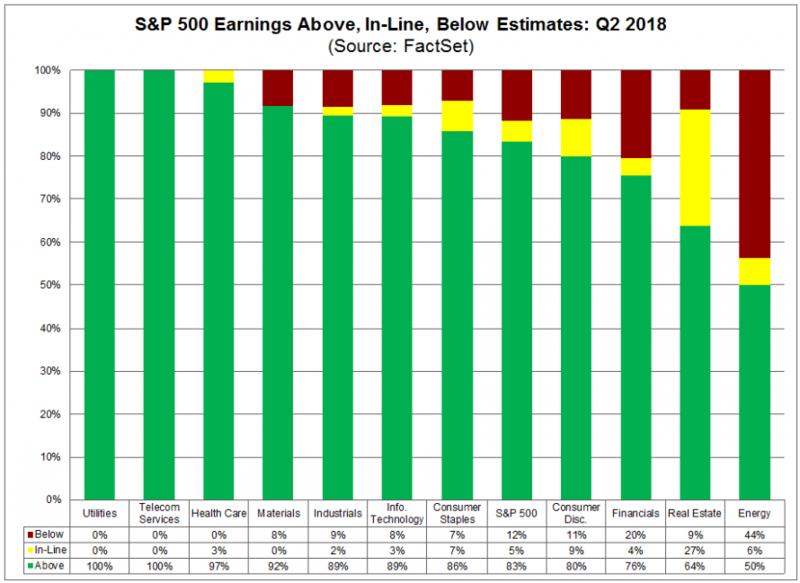 In aggregate, according to Factset, companies are reporting earnings that are 2.5% above the estimates (which however is fractionally below the five-year average). On the revenue side, more companies (73%) are reporting actual sales above estimates compared to the five-year average, while the average beat is 0.9% above estimates. Looking ahead, the year-over-year sales growth rate for the second quarter is 9.3% today, slightly higher than the revenue growth rate of 9.0% last week. Positive sales surprises reported by companies in the Health Care, Information Technology, and Industrials sectors were the largest contributors to the increase in the revenue growth rate over the past week. While all 11 sectors are reporting year-over-year growth in revenues, four sectors are reporting double-digit growth in revenues: Energy, Materials, Information Technology, and Real Estate. 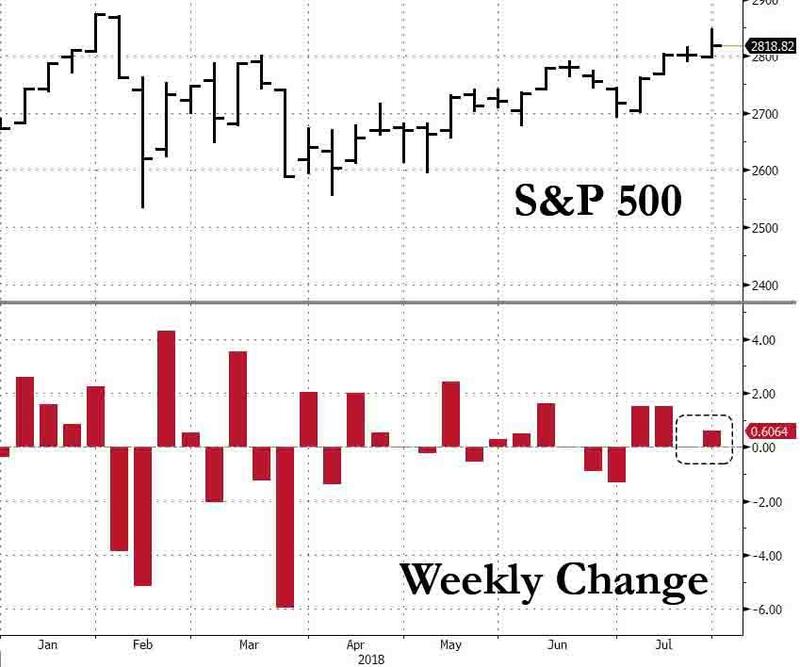 Armed with that information alone, one would think that the S&P has soared in the 2 or so weeks since the banks kicked off Q2 earnings season. Only that's not the case, and as the chart below shows, the S&P has barely budged in the time half the S&P has reported record earnings. Netflix plunged even though its net income rose 600%. Facebook just suffered the biggest drop in the history of US stocks, wiping out nearly $150BN in value, even though its revenue grew 42%. Intel tumbled nearly 10%, wiping out $20 billion wiped from its value, even as it beat all estimates. Twitter dropped more than 20% its biggest crash since 2014, despite beating on the top and bottom line. While there are more examples, the message is simple: merely beating estimates is no longer enough. 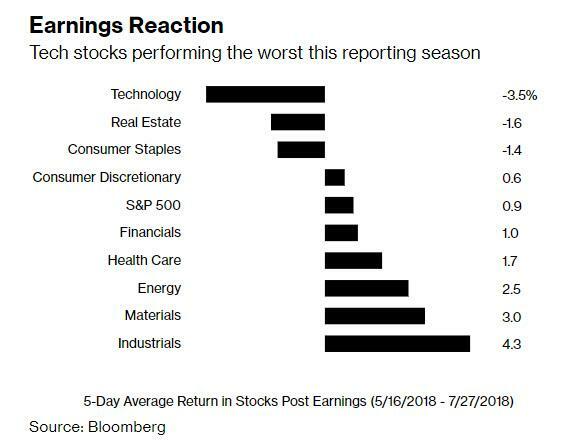 While all but one of the 36 tech firms that have reported results exceeded analyst estimates, over the next five days their stocks were down an average 3.5%. That compares with a gain of 0.9 percent for all S&P 500 stocks, according to Bloomberg calculations.. In other words, while the rest of the S&P is flying and generally remains inert to trade war concerns, for the software and internet titans that have led the bull market for nine years, "the strain of expectations is showing." Perhaps the biggest driver behind investor disappointment is that so far at least, tech names have generally failed to impress in their pivot from staggering growth to a more mature phase, with "new responsibilities and expectations." Companies are dealing with this new reality in different ways, with differing results. Social media firms have seen the most upheaval: The world has woken up to the power of these services to influence elections, spread misinformation and collect personal data on a massive scale. Results from Facebook and Twitter show the impact of early attempts to address such concerns. 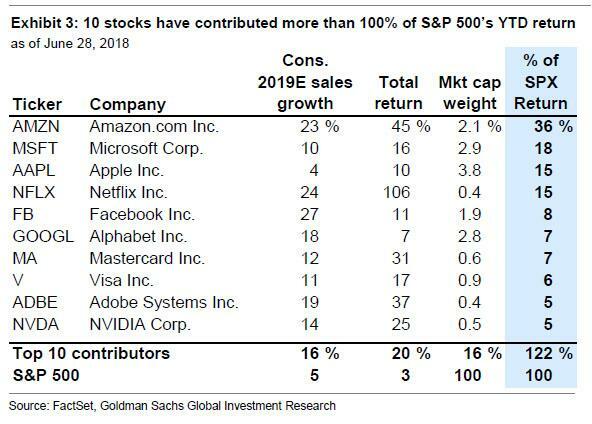 Some may counter that much of the upside was already priced in: after all recall that just four tech stocks, Amazon, Microsoft, Apple and Netflix, were responsible for 84% of the upside in the market in the first half of 2018. The argument can therefore easily be made that much of the potential upside has already been priced in. And, as Bloomberg notes, "nowhere are high hopes more baked in than with Amazon, whose 55 percent rally in 2018 has left it neck-and-neck with Apple in the race to be the first U.S. company with a 13-digit market value." Results from Jeff Bezos’s online superstore cheered investors Thursday. Its six-month net income was more than the previous seven quarters combined. The stock rallied, then gave most of it back. Why? Because investors are suddenly waking up to the realization that not only does AMZN need to execute flawlessly, but it has to keep growing at a torrid pace to even approach some semblance of fair value. Say its earnings in 2019 managed to be twice the $11.7 billion analysts predict. At $1 trillion, its price-earnings ratio would be a cool 43 -- more than twice the average valuation in the S&P 500. Meanwhile, with speculation that the next recession is at most 18 months away, traders are concerned that there is little chance these companies will have the required runway to reach their full potential: consider that at 19x forecast earnings, techs are trading at a 10% premium to the S&P 500: the widest since 2009. Worse, this premium is no longer warranted. 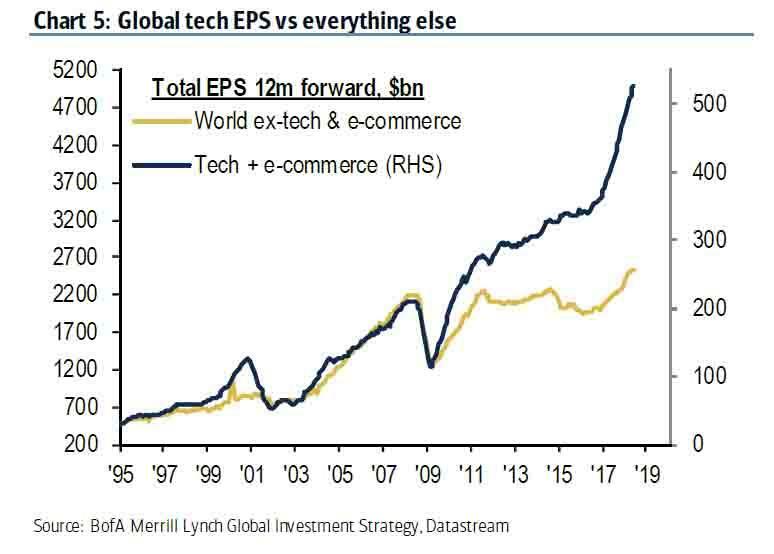 In fact, Q3 will mark the first time since 2014 that growth in technology earnings will trail the rest of the market: "computer and software makers will boost profits by 18 percent between July and September, compared with 21 percent in the S&P 500." 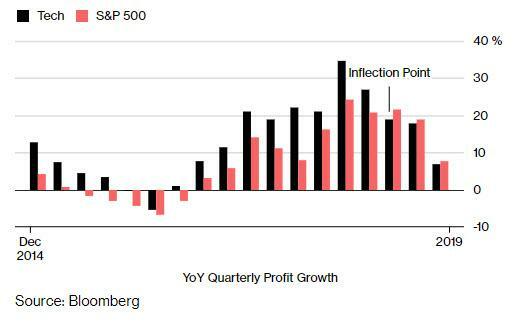 Finally, the reason why markets seem to be ignoring the record Q2 earning season is that future growth looks downright gloomy by comparison: after surging 35% in the first three months of the year, tech profit growth is expected to decelerate in each of the following four quarters, reaching only 5.5% at the start of 2019. And if tech grows just 5.5%, what's left for the rest of the market, especially with continued strong dollar headwinds, and the threat of a full-blown global trade war emerging in just a few weeks when Trump is expected to launch the next round of the US-China trade war. ... is the worst possible news.